With Christmas on our doorstep and stockings to fill, let this handy list 10 mindful gifts for your favourite people inspire you to give practical and beautiful gifts they’ll love! Nushka Serum is the gift to give for a positively glowing complexion. Hero ingredients, organic Rosehip Oil and organic Gotu Kola are Mother Nature’s anti-ageing wonders, hello hydration, goodbye fine lines. Perfect for mature or sun damaged skin. Nushka Face and Body Mist is great stocking stuffer for the loved one is always on the go. Easy to slip into a gym bag, carry on luggage or picnic tote, the mist is Mindfully formulated with Lemon Eucalyptus, Brown Boronia flower essence and Chamomile, to revitalize tired skin, soothe a busy mind and keep summertime insects at bay. A Turkish cotton towel makes for a truly versatile gift. Thin and light, Turkish cotton towels are the ultimate in multi-purpose giving. Use as a sarong, travel blanket, pillow, picnic blanket or beach towel. Great gift for the traveller in your life. A beautifully scented organic soy candle is the perfect aromatic stocking stuffer. Check out Brisbane candle and mason jar connoisseurs Ivy & Wood’s gorgeous range. For the eco coffee lover in your life, a cute high-quality borosilicate glass cup from Spilt Milk is an excellent choice. As a bonus, one dollar from every sale is donated to water.org with their mission of solving the global water and sanitation crisis. The handiest gift of them all, a reusable water bottle from Earth Bottles. Super practical, eco-friendly and beautifully stylish. Wine. The go-to gift when you’re stuck for ideas. Why not make it organic? Organic Wines have a range of organic and vegan wines that will please the fussiest drinker. Cheers to that! Discover Nature Lunch Box clever range of reusable lunch boxes. A sustainable solution to the use of plastic lunchboxes, these gifts are BPA, Phthalates and BPS free. Better for us and the planet. Give a gift that grows. You’ll find the perfect stocking stuffer for the gardener in your life at Little Veggie Patch Co. Veggie heirloom seeds in fun, retro-inspired packets and DIY books will inspire tasty gardening adventures in 2018! A simple reminder that the very best gift you can give this holiday season is the gift of your time. Just being with loved ones and enjoying moments and relaxing together, remember to put away your phone, log out of social media and be present! 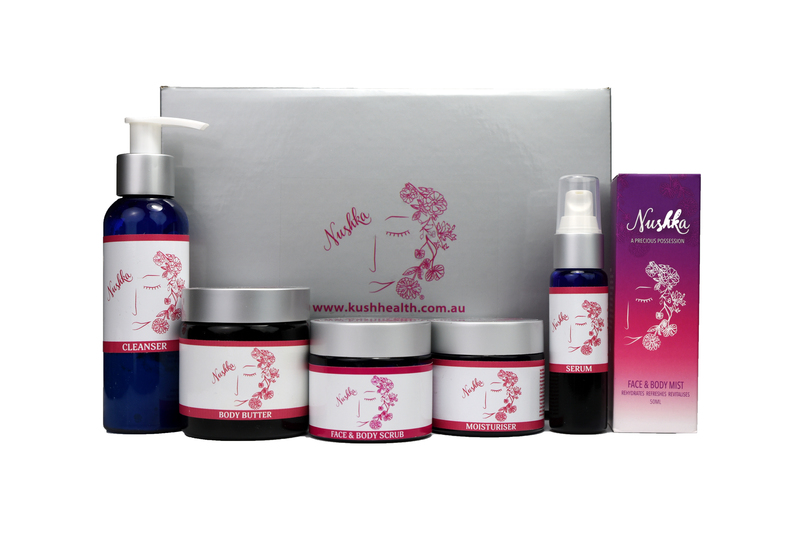 We currently have 20% off the Nushka Skincare range (excluding box sets) so don’t forget to visit Kush Health for more beautifully natural gift ideas for glowing skin. when checking out to receive 20% off!